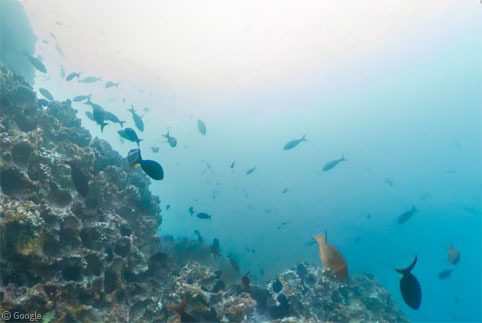 The latest frontier for Google’s Street View technology is underwater. 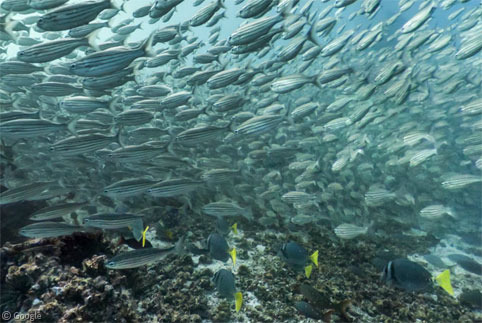 Cameras have visited quite a number of popular diving and snorkelling locations, giving us spectacular imagery of sea life and coral reefs. 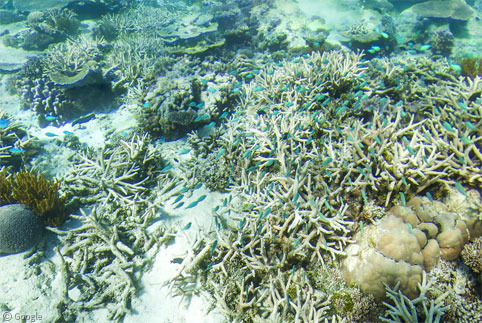 Today we’re taking a tour of these locations, beginning with Australia’s Great Barrier Reef, where we find a number of sea turtles. 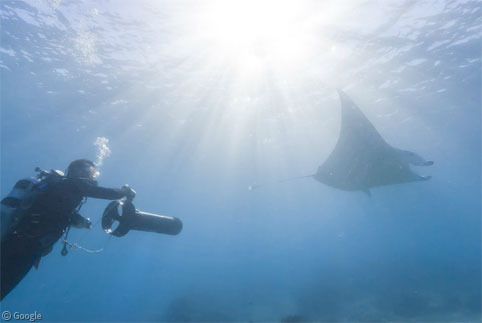 Further south near Lady Elliot Island a diver meets a manta ray. 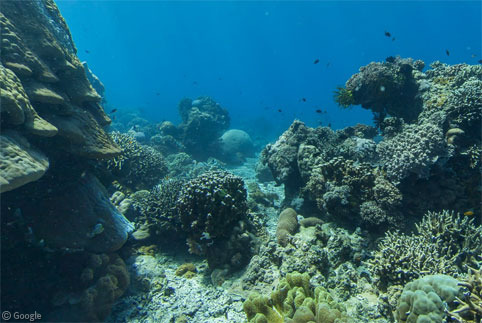 Moving north-west to the Philippines, a large area around Apo Island can be explored, revealing some spectacular coral formations and various fish. 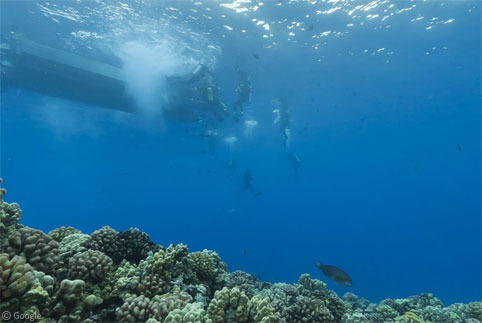 … and Molokini – a partially submerged volcanic crater – where we see a number of divers around their boat. 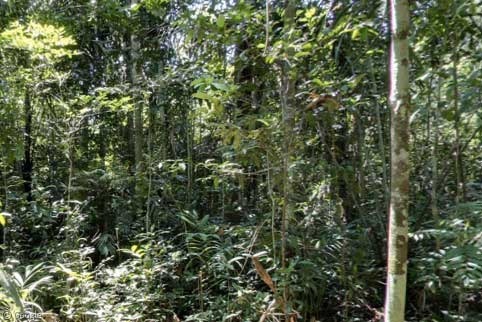 But enough of the humans, we’re here for the wildlife! 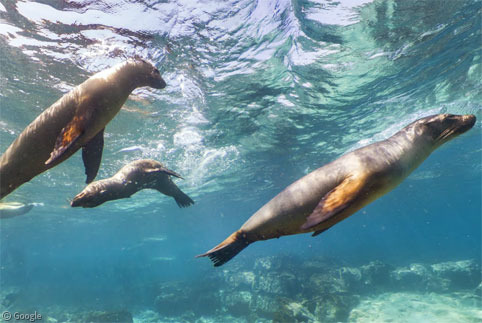 Continuing across the Pacific brings us to the Galapagos Islands where the cameras captured a group of sea lions playing in the water. 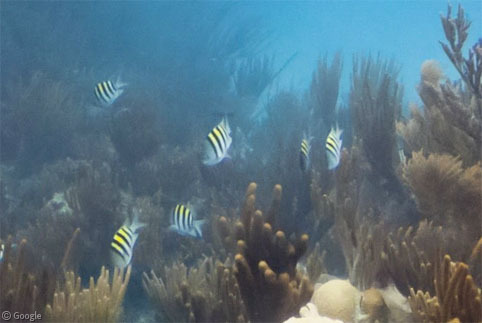 At nearby Devil’s Crown we find a large school of black-striped salema and a few razor surgeonfish. 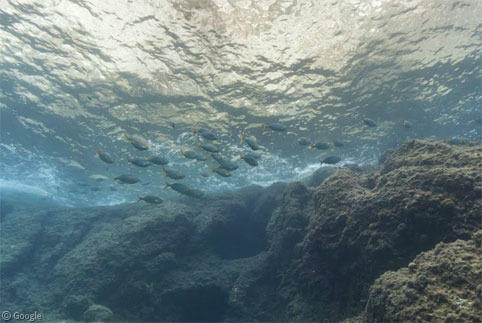 To the north at Gordon’s Rocks, the steep drop-offs are home to many types of fish. 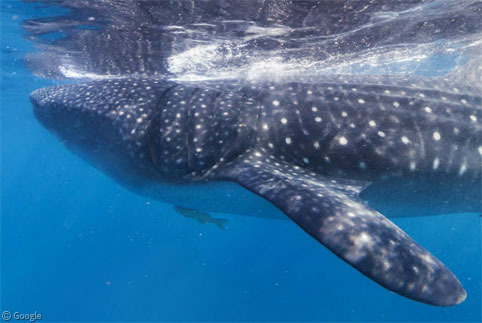 Wildlife doesn’t come much more spectacular than a whale shark, shown here off Mexico’s Isla Contoy. 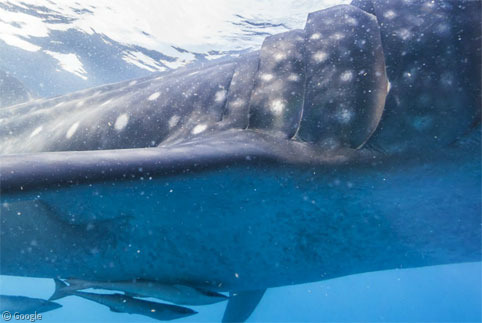 This largest of all fish can grow up to 12.5 m (41.5′) and weigh more than 21 tons. 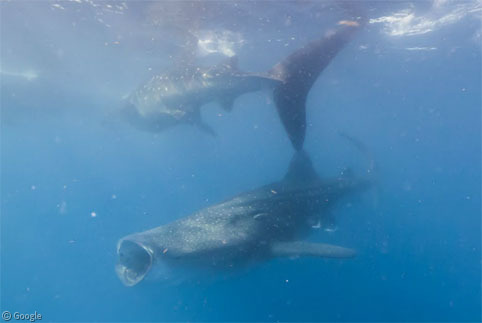 … and here’s a really close-up look at its gills, with remora attached to its belly. 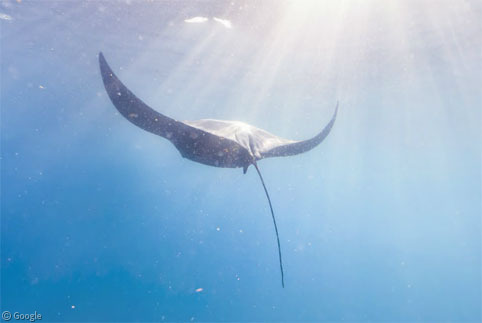 Turn directly around and you’ll see a huge ray. 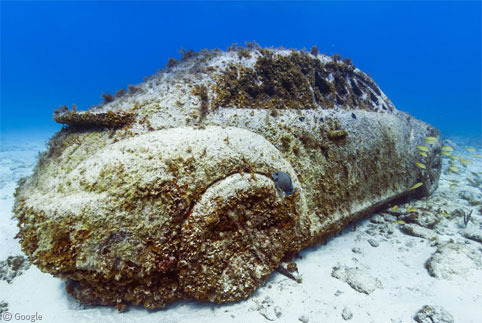 … and even a sculpture of a VW Beetle! This YouTube video gives a good tour of the museum. 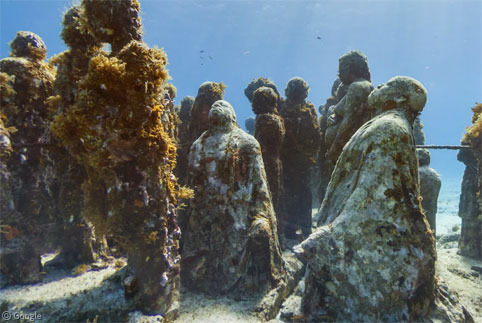 This writer has done some snorkelling off Cozumel, where a couple of locations have been captured for Street View. 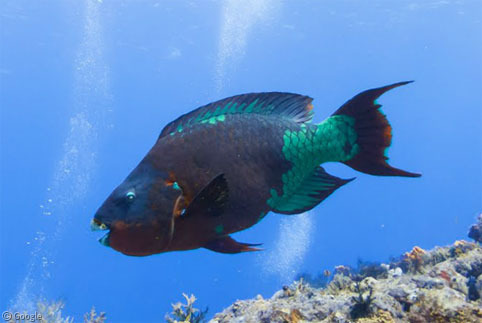 At the Santa Rosa Wall, there is even a lovely close-up of a parrotfish – one of my favourites. 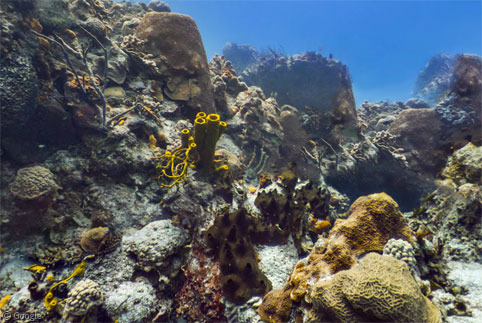 And at Columbia Deep the variety of coral is fascinating. 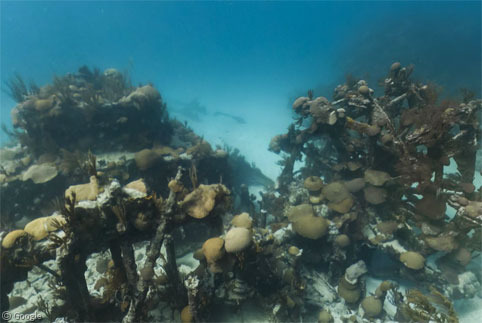 Imagery was also taken at the Sian Ka’an biosphere reserve, a marine location so important it has been named a UNESCO World Heritage Site. … and the wreck of the Mary Celeste. 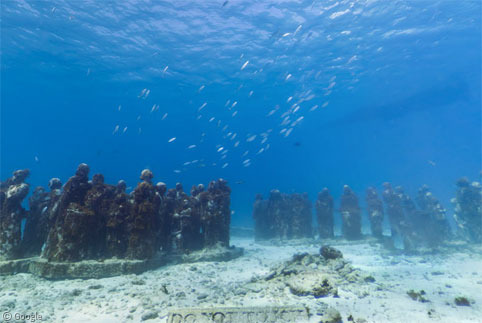 Not the famous ghost ship which was found off Portugal with its crew mysteriously missing, but still a notable vessel and one of Bermuda’s most famous wrecks – a paddle steamer used to carry weapons during the American Civil War. See this government web page for more details. 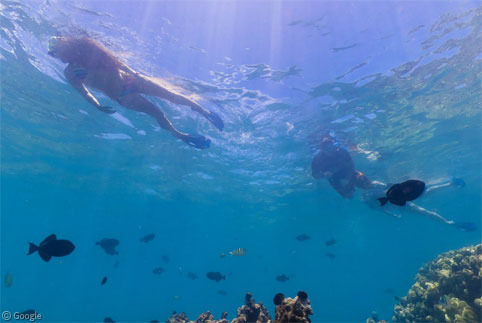 For our final wet location on this tour, we head to the Mediterranean and Monaco, where divers can explore the waters near the famous Oceanographic museum. We’ll end by visiting an underwater vessel – the Ocelot submarine, though we’re cheating slightly because it’s permanently moored in dry-dock at Chatham Dockyard. Much of the interior of the submarine can be explored on Street View, from the spartan and cozy sleeping quarters to the periscope, the galley, and the engine room. 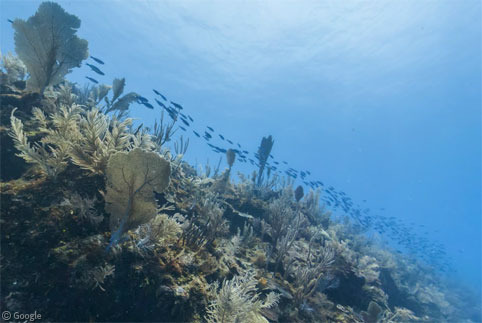 Please explore all the underwater locations featured above and be sure to post a comment with anything interesting that you come across! 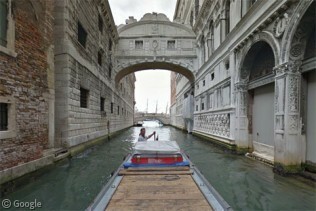 This is the third in an occasional series about out-of-the-ordinary imagery from Google Maps. In the first we visited wintery locations around the world in Google Snow View, and in the second we looked at rivers, canals and oceans with Google Boat View.